Scarp: Digital print on canvas. Shot: digital print of rust on canvas. Limited edition print. Wind in Mulga: digital print of rust on canvas. Limited edition print. Thylacine Mind: digital print of rust on canvas. Limited edition print. Town with Two Names: digital print of rust on canvas. Limited edition print. Little Lake: digital print of rust on canvas. Limited edition print. Madura Mourning: digital print of rust on canvas. Limited edition print. 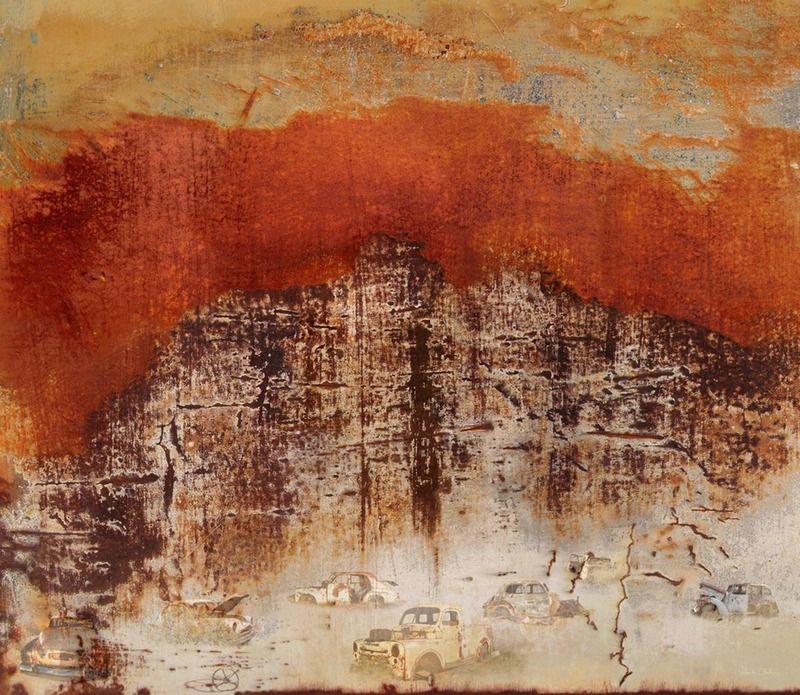 Lake Lewis: digital print of rust on canvas. Limited edition print. Infarction: digital print of rust on canvas. Limited edition print. Claypans after Rain: digital print of rust on canvas. Limited edition print. The Claypan: digital print of rust on canvas. Limited edition print. Rusty cars, abandoned on remote tracks, are part of the ‘landscape’ of the Central Australia. For me they are iconic reminders of the way we live here and the way transport changes our relationship to land, for both non indigenous and indigenous inhabitants. I value what they tell us about the history of our ‘colonisation’ and also the many questions they leave unanswered. These unanswered questions are perhaps their power… we can only imagine the stories these old cars hold. it’s in their captivating surface detail that this mystery is best embodied.